Many of you readers are parents and I am sure that you often thought you could design a better toy. When our children were young we thought the same thing and put our creative energies to that goal. During half of the 1980's my husband David and I developed toy ideas which we sold to the to toy companies to produce. It was certainly an interesting experience and we learned it is very difficult to impact the toy industry at all. Great Aunt Carolyn was recently cleaning out for a move and she still had a complete set of Bookville. 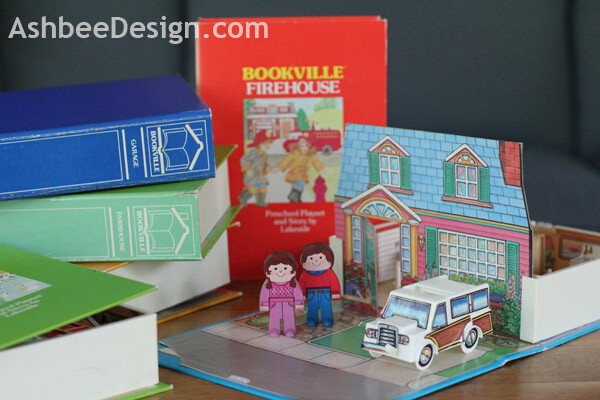 Bookville is one of the toys we designed. The concept was hard covered books that opened into houses and other building to create a town. We handcrafted a complete village out of wood and sold the idea several times. A small toy company produced it in 1985 and it was from this run that Aunt Carolyn sent over the five different designs. Each book opened, a front panel was slid into slots and its was filed with accessories, including two little people, a vehicle and furniture. Here is the Country Home with the Country Sedan parked in the the driveway. The entire set, which was produces by Lakeside in 1985 included a firehouse, barn, gas station, grocery store and a house. If you had all five you could create a village street. 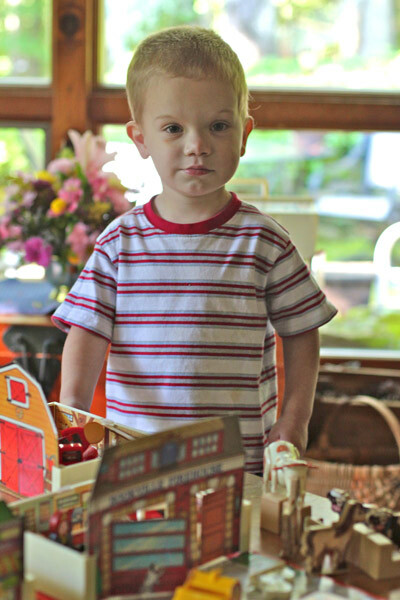 The entire play set came out for the first time with grandson Taylor, now 3 years old, visiting. He had a great time playing with the set and spent quality time creating scenarios and telling stories. Our disappointment with Bookville and the American Toy industry is its fixation on cheap is better and plastic is king. Every toy we designed, after being sold to various toy companies and processed through in in house design teams, came out looking like every other toy on the shelf. Bookville was priced at under $5, and disappeared as a concept because of poor construction quality. Taylor did have a lot of fun playing with the set which told me the idea was sound. I just kept the glue gun handy to repair it. i had these as a child and loved them!!! wish i could still get them for my child now! I know this is an old posting, but I just found my sets and started seeing if I could find them online. It actually surprises me that these weren't more common. I loved these as a child and had four of them (missing the barn). I am so happy I came across them, no glue gun was ever needed despite cheap design. Just wish the velcro had held out. Thanks for commenting. It is fun to connect with people that played with the few toys we did manage to sell into the industry. I wish Melissa and Doug was around back then because wood was our material of choice. My mom finally passed along our families set of these a couple months ago and I'm so so happy that my children will get to enjoy them too. I also wish I could find these again. I would buy them over and over!! I adored these! We had all but the barn, and my childhood friends still talk about them as their favorite toys at our house. They are certainly well loved. Wish I could purchase new ones for my daughter. Sara, Nice to hear from you. 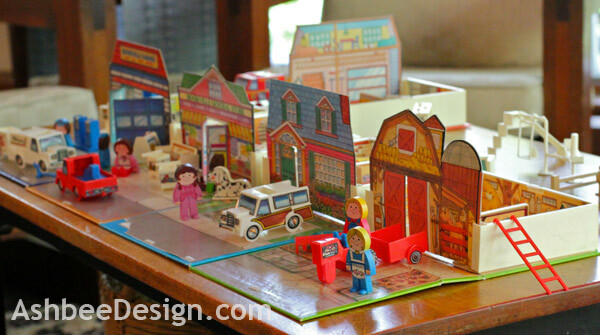 I wish a company like Melissa Doug had existed back when we designed these. The originals were out of wood and were much more durable. But it is a great idea that needs to be re-introduced in the toy industry.